At TACIT INVESTIGATIONS & SECURITY, our mission is to be the pinnacle solutions service provider of investigation and specialized security services to our clients through Innovation, Intelligence and Integration. Our agency is headquartered in the geographical heart of the continent, Winnipeg, Manitoba, Canada and is a full service, licensed and bonded investigations & security agency with service areas throughout Canada and abroad. Tacit Investigations & Security, along with its strategic network of industry partners, can offer services in most major centers throughout Canada and internationally, truly making Tacit the sound choice for your investigation and specialized security needs. Tacit Investigations & Security has a dynamic and diverse team of highly trained professional investigators in several fields of expertise, some include; Surveillance Operations, Cyber Intelligence Sourcing, Computer Forensics, Due Diligence, Process Serving, Criminal Investigations, Civil litigation, Intellectual Property & Trade Mark Protection, Corporate Investigations, Asset Recovery, Insurance Life & Health Litigation and Missing Persons are just a few of the services our agency can provide. THE EXECUTIVE TEAM AT TACIT INVESTIGATIONS & SECURITY HAS DECADES OF COMBINED FORMER LAW ENFORCEMENT AND MILITARY EXPERIENCE AUGMENTING OUR WIDE SUITE OF SERVICES MAKING OUR AGENCY ONE OF THE MOST COMPREHENSIVE IN THE INDUSTRY. Our team has established extremely close working relationships and strategic partnerships which can be used to provide the pertinent, detailed insight into the parties involved in your business matters, delivering the due diligence that you can rely on in making confident and informed business decisions. Tacit Investigations & Security focuses on comprehensive personalized due diligence investigations and public record checks throughout Canada and internationally. We offer timely and sophisticated insight by gathering and analyzing business-critical intelligence. Tacit has established and currently maintains accounts with all of the major data aggregators, public records sources and additionally maintains a large network of strategic partnerships to seamlessly obtain the information you need. Our team is highly skilled at extracting hidden information and obtaining documentation required for your file. QUALITY PRIVATE INVESTIGATORS AND SECURITY SPECIALISTS EMPLOYED BY TACIT HAVE BUILT THEIR REPUTATION BY SUCCESSFULLY HANDLING THE DIVERSE NEEDS OF OUR CLIENTS. WE COMPASSIONATELY HANDLE YOUR NEEDS AND ACT WITH GREAT INTENSITY TO SOLVE YOUR MOST PRESSING MATTERS. Our mobile and static surveillance team is equipped with the most advanced proprietary surveillance platforms in the industry and are well suited for complex surveillance operations. Our due diligence investigations provide comprehensive background information and intelligence regarding the subject’s personal and business reputations, records of litigation and disputes and additional details. Understanding the importance of integrated actionable intelligence sourcing is crucial for all companies. We lead the industry in every component to a successful intelligence program. 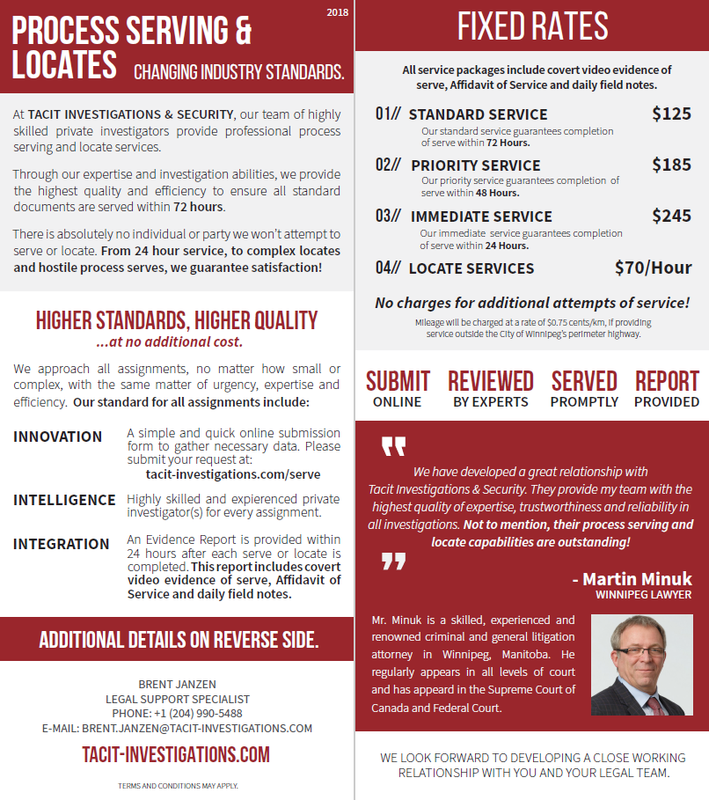 Our innovative and intelligent private investigators highly exceed industry standards while adhering to all laws, regulations and safety standards in Canada and abroad. Our highly skilled and specialized security teams are fully equipped, trained and certified to handle all types of complex situations. Our members are defining a new age in corporate and personal security. Using the latest state of the art forensic tools, our Cyber Forensics Unit (CFU) are well equipped to recover deleted, lost, or erased files, establish timelines of computer use and prepare court ready documents. At anytime, please feel free to contact us regarding any questions or concerns you may have. We are happy to provide advice and our professional opinion on all matters. Thank you again for your interest in Tacit Investigations & Security. Jeff Stone, along with his diverse team of investigators and security specialists have develop a strategic plan to advance the agency's mission and objectives, which allow Tacit Investigations & Security to foster revenue, profitability and sustainable growth. Overseeing the company’s operations, directives and initiatives, Jeff and his executive team of experts will continue to strive to ensure that all clients of Tacit Investigations & Security will be provided with cost effective and efficient management of resources to ensure unparalleled quality and service. To see Mr. Stone's full resume, licencing and certification click here or view on LinkedIn. We are here to offer you expert personalized investigations, specialized security and legal support services whenever you may require it. Our specialized team members will always strive to find you the best possible solution. We primarily serve in Western Canada, but have the ability to serve in every province in Canada and around the world. Thank you for contacting Tacit Investigations & Security! A licensed, bonded and insured cOMPANY. Licensed with the Government of Manitoba Department of Justice.